vinegars and oils and gardens, oh my! First, a reminder that today is the last day for early bird registration for the Gardeners Mini College. See details on the right. Second, stop by and see me at Down to Earth tomorrow! I’ll be downtown at the store doing a free demo on safely preparing flavored vinegars and oils. The demo runs from 1-3 p.m., as part of the summer series with the OSU Extension-Lane County Master Food Preservers. We will have plenty of herb and garlic oils and delicious, fruity, flowery vinegars to taste (on home-baked bread!). I’m very excited to announce that I’ll be joined by Pat Patterson, a veteran MFP and Master Gardener, who knows more about plants and preservation than anyone else in town. You may have heard her on one of many gardening shows or local seminars. We turn to Pat when someone has an obscure insect to identify or a rare plant issue or anything else about which no one has a clue. This demo is appropriate for beginners, but even advanced preservers should take note. With Pat, you can ask any question you like! 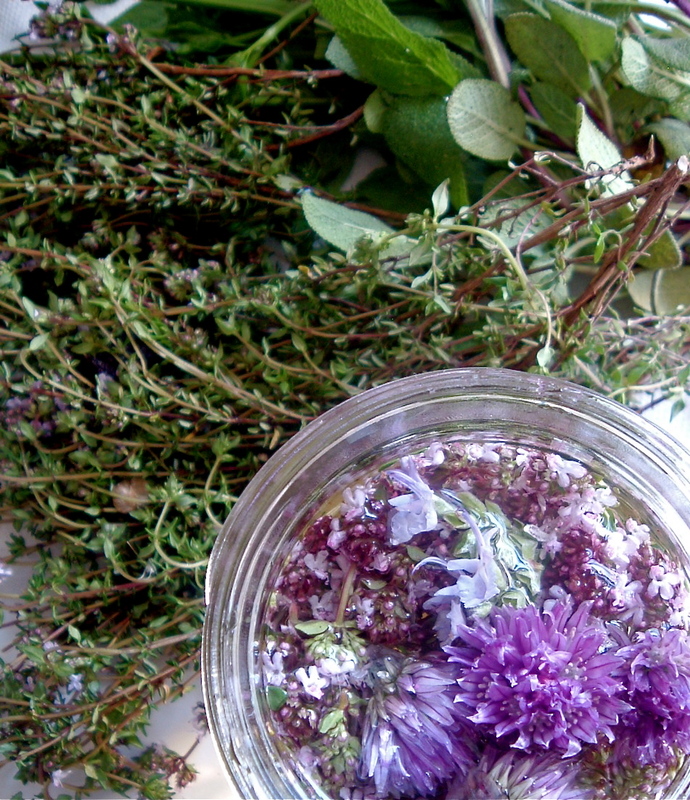 Plus, one of the handouts we’ll have at the demo is a list of edible local flowers, prepared by a friend of Pat’s. It might be worth it to show up just to pick up one of these. And to say hello, of course! Your summer salads will thank you. 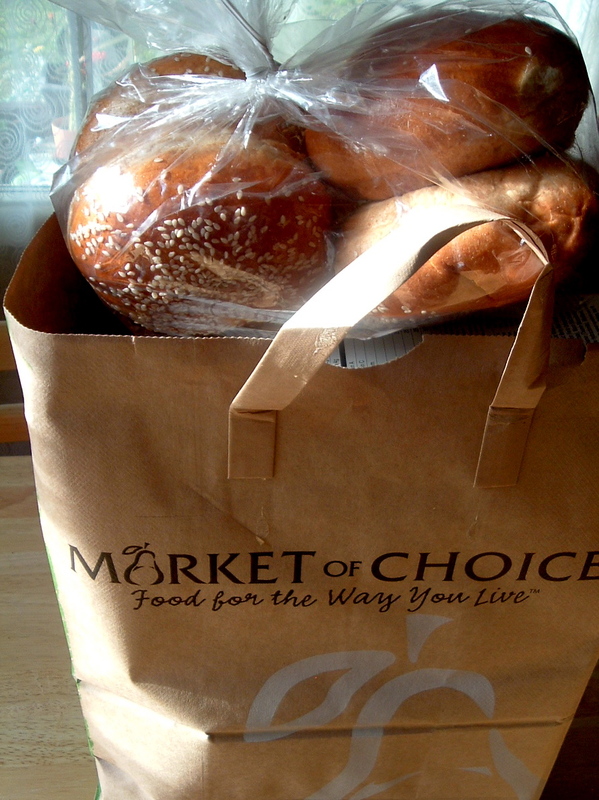 1) The grocery store bag hysteria is sweeping the nation. Yes, I do need a bag for the dozen things I have just purchased at your grocery store. Yes, I have a reusable bag, but I rarely use it at the grocery store. Yes, I know plastic bags damage the environment, and paper bag manufacturing pollutes. But I actually REUSE my plastic AND brown paper bags, and I NEED them in my efficiently run, eco-conscious domestic economy. I’m happy to pay a few extra cents for them, if necessary. I am not happy to be chided at the grocery store for using them. I am also not happy to have all my groceries stuffed so full into one bag that I can’t lift it by the handles, just so I can save another bag from extinction, like a spotted owl or something. I am also even more not happy to have to tell the clerk to rebag my groceries so I can carry them. Am I alone in this? This happens at all our local markets (not just Market of Choice), and it drives me crazy. 2) Dear gyros establishments in town, thank you for existing, but please put more garlic in your tzatziki. As in put SOME garlic in your tzatziki. We can handle it, I promise. And no grated cheese. Ack. 3) Bought my first tayberries of the season at Lone Pine Farms the other day. The prices! OMG!! Even worse than strawberries. Looks like it’s U-Pick for me this year. Good news is that strawberries, on their way out, are being discounted at some local farms. Thistledown has Bentons and Shuksans. Lone Pine thought it has Shuksans (it did, from the looks of it) but had no idea what kinds of raspberries it was selling. Time to get on that — people are asking. 4) On my way home from the airport, I spied a Thai food cart way out on Hwy. 99. Ubon Thai is like a cry in a desert — why so far out of town? Haven’t checked it out yet, but the menu and hours are posted on Craigslist. Craigslist? 5) Bar 201 recently took a debilitating hit; will it survive? I was sad to hear bartender and cocktail menu developer Richard Geil left for understandable reasons and is now manning the bar at Café Zenon. Good thing for Zenon, as I was recently horrified by a friend’s “Old Fashioned,” served with scotch. Bad thing for 201, since no one else seems to know how to make a standard, much less a creative cocktail. What a shame. And “Dressed to Kill” ladies night, with prizes for the best dressed barfly? Ugh. Well, maybe it will distract from the drinks. But a rather bad PR move for female customers who want to enjoy a cocktail without having their bodies mauled by prize-giving eyes. Jesus Christ. 6) I’m getting irritable, as I always do writing about Eugene’s dining scene, so…Dickie Jo’s. My husband, who doesn’t mind it, was spot on when he said it was a restaurant designed on a spread sheet. Simplified menu, cheapest ingredients possible that still allow the gold star of keeping the ‘premium’ label, highest prices possible. Soft-serve instead of real ice cream for the shakes, high school sweat shop labor, thin burgers that encourage ordering up to a double patty, etc. The faux 50s diner branded with “Westraunt Concept” absolutely repellent. Someone stop these people. “There’s no pickle on the menu so I couldn’t order a burger,” I said grumpily, when the weirdly hovering owner came over with my iceberg and blue cheese salad, noting aloud that the lettuce wedge was too big and needed to be downsized. Lactic acid is crucial in the fermenting process of “all-natural” pickles made with brine, and I hardly think his pickles are better than mine. But whatevs. I was more interested in way the West Brothers are appropriating the In-n-Out concept. For those of you who haven’t had the joy of living in Southern California, In-n-Out is a local chain/cult. You can read more about it here, on one of my fave food blogs out of Portland, Guilty Carnivore. The red and white color scheme, the “secret menu,” the limited options: all In-n-Out. The huge difference, of course, is the prices. Westronauts, take note: a double burger at In-n-Out costs $3.50. Dickie Jo’s charges double that. You’re charging WAY too much, even for Eugene, which is used to getting reamed for mediocre food. My iceberg wedge was saturated in blue cheese dressing, the burgers were decent but greasy, and the garlic fries were soaked in oil and a little bit of parsely and garlic. (There’s no need to add more oil when you toss them with the garlic topping.) A pickle, I’ll admit, when brought to the table after my grumbling, was pretty good, though I think I detected some lactic acid in there. Meh. Am I just bitter about another burger joint in Eugene when our dining scene so desperately needs diversity? Perhaps. But the last thing we need is an independent local business that acts like a chain, and a pricey, gimmicky one at that. Some of us are really, really tired of “fun” dining concepts and being treated as unsophisticated chumps. Feel free to disagree. My dollars are going elsewhere. 6) The good news is that just a block away, a little slice of heaven has burst from the clouds, and drifted down into my coffee, dreamlike. Vero Espresso House, on the corner of 14th and Pearl, is the opposite of EPIC FAIL. It’s a cute renovated house, with great coffee (Stumptown) prepared well, and cozy indoor and outdoor seating. There is a limited menu of pastries, cookies, panini and soups. According to the barista, the menu’s in flux, so expect some new sandwiches (e.g., roast beef) and a more stable soup menu (i.e., set days for specific soups) soon. I’m a huge fan already. As a new Master Gardener and speaker, I am so proud and pleased to announce the 26th annual Gardener’s Mini College from Aug. 5-8 at Oregon State University. The theme for the 2009 conference is “Backyard Food Solutions: Local, Sustainable, Secure,” and there will be a wide range of classes, demonstrations, and workshops for gardeners at every level of experience. I will be giving a talk on Friday called “Feeling Good in the Neighborhood: Local Eating and Food Sharing” on locavore diets and mini food networks in the Willamette Valley, showcasing some of the ways we eat and share our local harvests. I’d love to see you all there. But my talk is the least of it; the schedule is full of wonderful presentations on all aspects of edible gardening from bees to compost. Please join us! The conference costs are reasonable, and they offer options for attending the entire three days with lodging and meals to attending one day of classes and brown-bagging it. You will find a full description of the speakers, classes, and registration options at the Mini College website. Read more below, from an announcement sent to me by the organizers. Please take note that early registration ends in mere days! Save money and register by June 26. More than 30 classes, tours and workshops on a wide variety of topics will be presented at the CH2M Hill Alumni Center, at at locations around OSU’s Corvallis campus. Topics include cover cropping your vegetable garden, home winemaking, backyard chickens, organic vegetable gardening, heavy metals in garden soils, home orchards, pruning fruit trees, backyard wine and table grapes, composting, season extenders, making teas from garden herbs, dealing with deer and other mammals in the home garden, permaculture, preserving produce, an in-depth look at garden fertilizers, and many more. You may find out more about the event [and register online] at the Mini College website. Registration is $157 until June 26 includes all meals (Wednesday evening – Saturday morning), the Thursday Evening Garden Tour and all classes (Thursday and Friday). Thursday and Friday Classes and the Thursday Evening Garden Tour , without meals, is $63. After June 26th, registration increases by $7. Other events are a silent auction, seed exchange, food drive (including fresh produce) for the Linn-Benton Food Share, OSU Bookstore, Search for Excellence celebration and OSU Master Gardener chapter sales and displays. The Gardener’s Mini College is presented by the OSU Extension Service Master Gardener program and the Oregon Master Gardener Association, in cooperation with the OSU Extension Service. Love. Love. LOVE. Bentons are ready at the markets in the Willamette Valley. I had to buy a half-flat yesterday (this year’s prices, omg!) 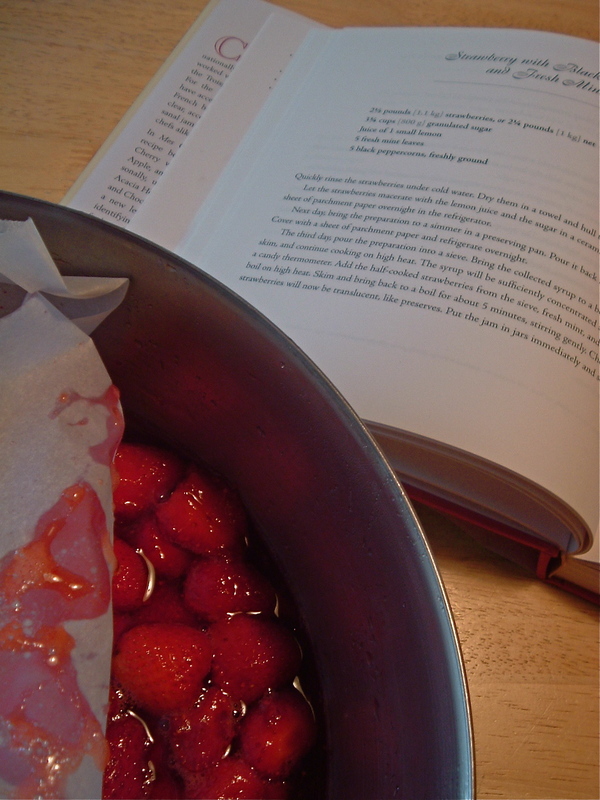 to put up a batch of no-pectin strawberry black pepper basil jam, inspired by Christine Ferber. Bentons might be the lightest in color of the strawberries, so they make ruby red jam. The taste is gorgeous: light yet complex, not really a true, musky, old-timey strawberry, but rather a little burst of sun. And speaking of sun, where is it? I’m getting worried about my tomatoes. Made it back home, happily against storm traffic making its way eastward across the country. By the time I landed in Eugene, 13 hours later, having survived the cattle cars and two layovers of 3 hours each, I was ready to never travel again. And you know what? I’m not travelling for many, many months and I couldn’t be happier. My time in Buffalo was fantastic; it’s a fascinating city and I felt welcomed by a warm community and enriched by its history and generosity. I spent a month and a half working on my next two academic projects, researching rare books and periodicals. Now it’s time to sort through the material, head back to the library, and figure it all out. Home sweet home. Needless to say, I haven’t been doing too much cooking. I did have access to a kitchen in Buffalo, and managed some creative grocery-buying, so I haven’t stopped *thinking* about food, but it’s going to be a while before get back in the swing of things. There’s so much to catch up on…I think I’m going to start posting shorter blog entries for a while. Thought I’d start by making a batch of elderflower strawberry jam to exercise my jammin’ fingers. I used a new varietal, Puget Summer, and a flat that was looking a little beat up. Wanted to get a batch done before Saturday night’s going away party for a friend. Solutions? First, one needs to let the cooked jam sit for a few minutes before ladling it in to the prepared jars. Some suggest tipping over the jars once processed, to redistribute the fruit as it cools. I’m not a big fan of this procedure, since it smears jam over the top of the lid. You could also use low, squat, wide-mouth half-pint jars for jam to disguise the fruit floating issue that becomes much more apparent with a long, skinny jam jar (I usually do this, ha!). Other people add a smidge of butter, but I dunno. I wonder about safety here, plus it sounds kind of gross. The best way I’ve found to address the problem is to make no-pectin jam, which usually involves macerating the raw fruit in sugar overnight. The fruit becomes heavier as it soaks in the sugar. Plus, you cook no-pectin jam much longer than the pectin-added stuff I’ve never had problems with no-pectin jam fruit floating. 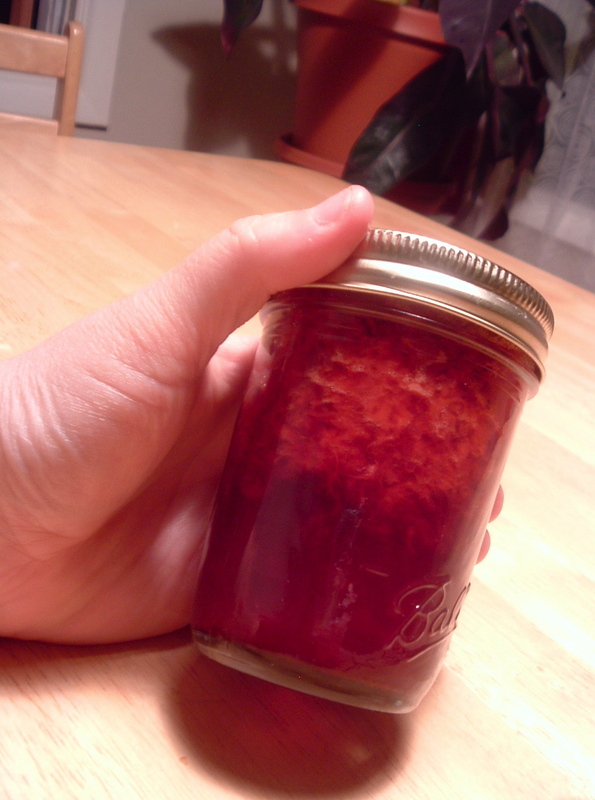 Of course, no-pectin jam contains about 3x the sugar as my Pomona jam, so there’s the trade-off. Open a jar, mix contents with spoon, serve. Life is too short to worry about floating fruit. One of the best of many fantastic services provided by Food for Lane County is the summer lunch program in our local parks. Kids playing in the park can stop by for a free lunch weekdays from 12- 1. The money is earmarked for children, so accompanying adults will need to bring their own meal. You can find a list of sites in Eugene, Springfield, and other Lane County areas on FFLC’s website. Most sites opened June 15, but Eugene, Bethel, Veneta, Florence and Mapleton sites open June 22. I noticed a few of the sites also serve breakfast. Please note that all children are welcome, not just low-income kids. The more meals they serve, the more money the program receives. You can read a story about this program in the R-G here. For local, low-income readers: Interested in receiving a free food box or shopping at the food pantries? Learn how to get help in several ways by checking out the resources FFLC provides here. There is enough garlic in this dressing to kill every vampire west of the Cascades. Do not serve to bloodthirsty guests or ghouls who eschew strong flavors. Vegans might perish by just being in the room with this dip. Even garlic lovers will cry out in pain/joy/pain/joy. I heard about this recipe from a Master Gardener colleague. Legend has it that this dip disappears within moments of being served at Extension gatherings. Gardeners drift by with thick slices of slathered bread, leaving a trail of garlic on the breeze behind them. When I heard that, I knew I had to try it. And so should you. This dip is easy enough for people who can’t cook and is thick enough to be used to stuff unsuspecting cherry tomatoes and such. Chop garlic to bits in food processor. Add remaining ingredients. Serve with Buffalo wings, crudités, iceberg wedges and bacon, tomatoes, or keep it simple: in a bread bowl with hunks of bread. P.S. 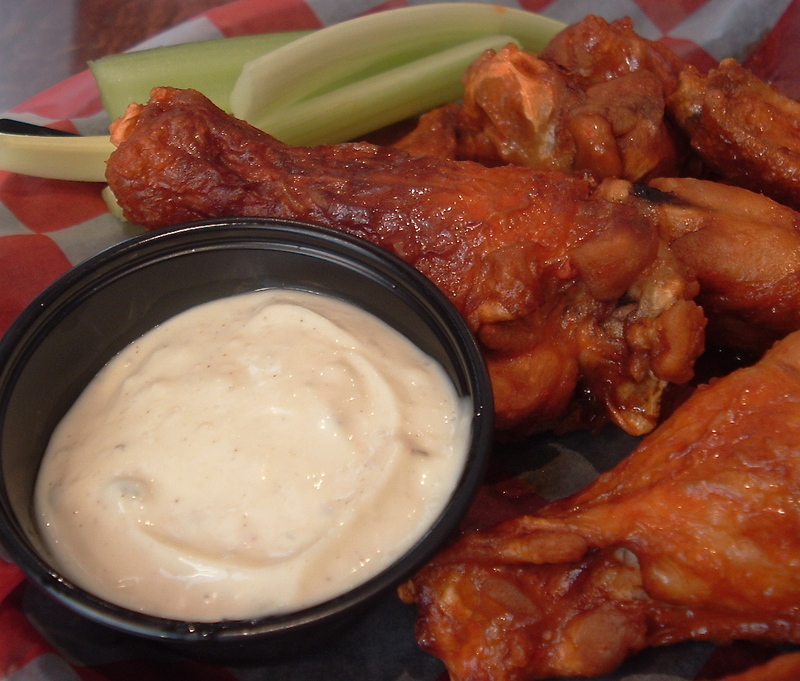 The image is of chicken wings at Anchor Bar in Buffalo! My dip is thicker and less mayo-ey. Work is going well here in the Buff. I’m off to the conference and won’t be blogging for a week or so. Catch you on the flip side!